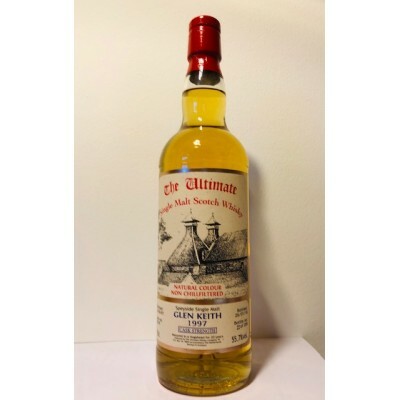 The Ultimate Glen Keith 20 years old 1997 is an older Speyside single malt from the Glen Keith distillery bottled by the Dutch independent bottler The Ultimate (van Wees). It was distilled on the 26th of May 1997 and matured in bourbon hogshead 72579. It was bottled on the 26th of January 2018 at natural cask strength of 55,7% ABV, non chill filtered and with no added colour. This is a limited single cask release of 285 bottles.